Positive Luxury was founded in partnership with Karen Hanton MBE, founder of toptable.com. The two trailblazing entrepreneurs combined their experience and knowledge to use technology to demystify sustainability and positively communicate a brands’ action directly to the consumer. Diana’s entrepreneurial spirit has driven innovations in the way that brands communicate on their commitment to social good and environmental responsibility, with companies seeing the true benefit of investing and incorporating responsible business practices into the companies’ DNA. This began with founding a sustainability communications consultancy, Clownfish, in 2002 which Diana built to international success, with a presence in 5 markets including China and USA at the time of exiting the business in 2008. 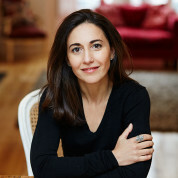 Diana is a globally recognized figure in the sustainability field, having been trained by Al Gore at the Alliance of Climate Change in 2007 and subsequently being honoured by the World Economic Forum as a Young Global Leader in 2011, also serving as a board member for the World Economic Forum Young Global Leader community. Diana is an advisor to the British Fashion Council, House of St Barnabas and the European Chapter of Conservation International. In 2015 Diana was named as a Luxury Women to Watch in 2016 by Luxury Daily. "I believe that education delivers long term social and economic gains for individuals, families, communities and nations as a whole. The role of teachers is primarily to inspire the leaders of tomorrow. Their role as educators, caregivers and community leaders, is something that should be rewarded. It is a real honour to be involved with the Global Teacher Prize and contribute to find those outstanding human beings that contribute to making our world that little bit better."